Properties in Reykjavík East average 4.3 out of 5 stars. Property 13: Reykjavik centre flat for 6 guests. Simple and quiet in the city center, free parking. Property 33: Simple and quiet in the city center, free parking. 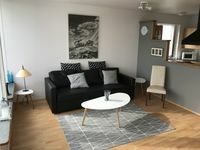 Property 35: Laugarnesvegur 64 - Bright and nice apartment in close proximity to Reykjavik Center. Property 50: Big, cozy apartment , 3 min walk from centrum. Nicely kept and clean. Comfortable beds. Beautiful view of Reykjavik. Nice kitchen, but it only has a Nescafe coffee maker, so make sure you find the proper pods or there is no morning coffee. Door to the deck was a little hard to close, but over all a pleasant and reasonable place to stay.